We had been noticing a new logging site about 10 miles south of us where there were several large piles of scrap logs left over. 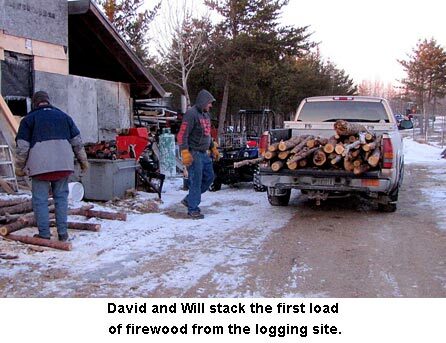 Luckily, David noticed a sign with the logger’s name and phone number on it. He called him and asked for permission to go in and take firewood. The man said yes. So on his way home from Virginia (the town, not state! ), David drove in and loaded up a medium-sized load. He didn’t dare load more heavily as his truck’s frame is pretty rusty. He and Will unloaded it. The next day, Will took our old Chevy truck, “Old Blue,” over there and loaded up a real big load. Then on Sunday, he went back for another load. I helped unload at home and he went back for still another load. 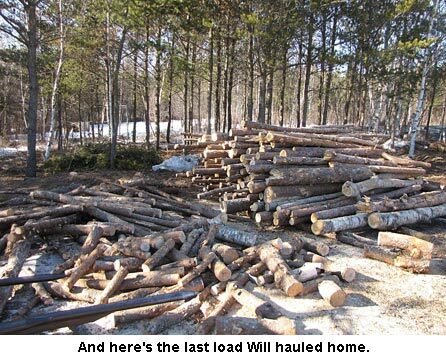 And with the sun shining brightly and temps approaching twenty degrees, Will (and Hondo) went back for more wood. We know there won’t be many more days because the temps will warm up on Thursday and the site will become impassable, even with a four-wheel-drive truck. So we’re hurrying as much as Will’s bad back will stand. Yep, we have woods on our land. But by getting this free wood, we’re saving our own wood to use later on. Some of the poles are tamarack and will make good fence posts so we’ve set them aside for fencing projects this spring. Talk about a wonderful windfall! All it cost was one phone call. Thanks, Jackie. Makes sense if you have to burn, better to get double duty in a wood stove rather than a brush pile. I may not have my homestead yet but I am sure planning and gathering as much information as I can to be prepared. Your prayers would be much appreciated. We go through about 9 cords for everything but bear in mind, we burn about anything, including “junk” wood such as dead balsam fir that’s kind of punky. It burns, puts out heat but sure doesn’t last long so we need more. And we also burn small wood which is little sapling poles, cut up to stove length. As we clean up our woods, we put all the wood through our wood stoves instead of burning brush piles. We’ll pray for your homestead too! Hopefully it’ll come soon. These days I think most people’s war cry is “cheap or free”. Seems like the costs of everything keep going up but the means to pay for them don’t. Land, self-reliancy skills and helpful friends/neighbours are like gold. Jackie, you and Will are diamonds! You are so inspiring and encouraging to the rest of us. I haven’t been able to get my homestead yet but I keep praying. Just out of curiosity, if you don’t mind answering, how much wood is needed in a year to heat two stoves and the stock water tank? Good to hear you’ve got more wood! Yeah, while Will and David were hauling, Will’s back was getting pretty sore. But now the rush to get it here is over, he can take it easier and let it re-group. Ours, too! Unfortunately, we burn mostly pine, spruce and some ash; we don’t have much hardwood up here, although we’d much prefer it. You use what you’ve got and we’re really happy to have it. Now a cord is in the wood shed, split and very dry. Onward…to the next nine cords!! Well Jackie I am TOTALLY jealous of the free wood, but you guys deserve it. We just had a load of wood dumped in our driveway, but not for free albeit it was still quite cheap considering we will get about 3-4 cords out of it after cutting and splitting; plus it is oak, so still not too sad that we had to spend some $ for it. Hope Will’s back holds up! What a great haul Jackie and Will!! Just wonderful. I got my seeds and can’t wait to plant. How about an article on homesteading over 60!! Some of us are there and I notice I am slower! Sometimes I have no help and sometimes I do. Just a thought. Happy Spring to you all!! Wow! All that free wood is a real blessing. Not only did you get free wood, you got free wood that was already cut and ready to load. Great deal! BTW, later this week I’ll plant the tomato and bean seeds I bought from you. I can’t wait for fresh tomatoes!